Right, Wing-Nut! : Chuck Hagel: Obama's PERFECT Secretary of Defense ! 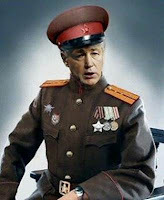 Chuck Hagel: Obama's PERFECT Secretary of Defense ! ....He said that Hamas has to be brought in to any peace negotiation. But that's OK, apparently. John McCain and Lindsey Graham aren't bothered enough by it to block the nomination, and jeez - American Jews voted for Barack Obama in massive numbers, well aware of his, ahem, "proclivities".